We’ve moved into our new home! After three months of renovations, we are in, mostly unpacked and feeling settled. It feels beyond wonderful to have our own home again and to be able to put our stamp on all the little nooks and corners. And there is something about this house that just feels so right to all of us. Like we’ve always been here! As I’ve mentioned before, the house was built more than 120 years ago, and because it already came with beautiful, old details and charm, I wanted to honour the style of the house and renovate in keeping with the era it was built. Keeping this in mind helped make it easier to make design decisions throughout the house. It wasn’t as easy to find traditional clawfoot bath tubs here in Australia as it was in London, but I insisted because I loved ours in London. The bath tub is from Victoria & Albert Baths and it is the Cheshire bathtub in the ‘anthracite’ colour. 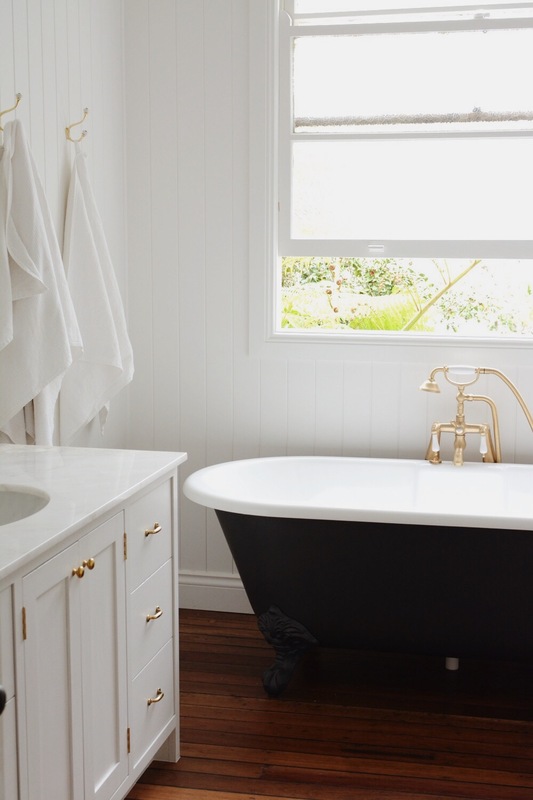 What’s cool about this bathtub is that it’s made from a volcanic limestone material called ‘Quarrycast’, as opposed to traditional cast iron, and it’s strong, durable, easy to clean and naturally insulating. We decided to leave the original wooden floors in this bathroom instead of ripping them out and putting tiles down. 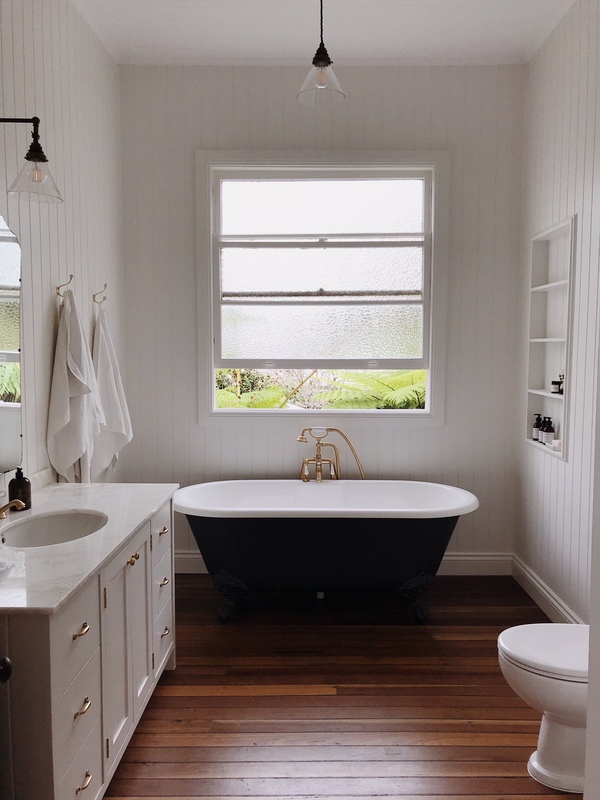 I just couldn’t stomach the thought of removing the pretty floors, and also it adds so much warmth to the bathroom to have wooden floors. To protect the floors from water damage, we filled the cracks between the floorboards with a black sealant, so no water could penetrate. We then coated the floors with a clear, matte polyurethane sealant. You can’t tell it’s on there, but it is meant to be really hard wearing. Fingers crossed! 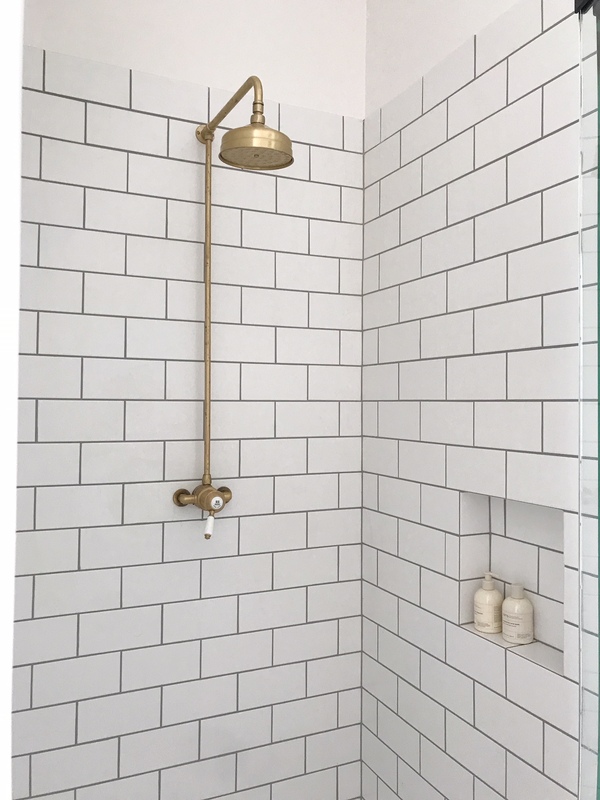 I chose traditional subway tiles for the shower and small hexagonal tiles for the shower floor. I love the combination of those two tiles (we had the same in a bathroom in London). We had a joiner custom make the vanity unit to match our kitchen cupboards. It’s painted shaker-style timber cupboards and drawers. The paint colour is Dulux ‘Grey Pebble’ in quarter strength. It’s a very warm light grey colour that goes well with our wall colour of Dulux ‘Natural White’. 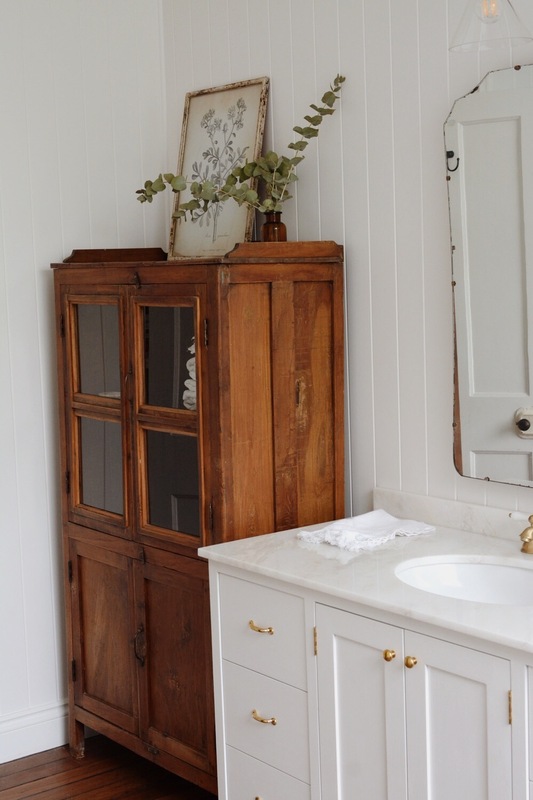 The brass hardware on the vanity unit is from a US-based company called House of Antique Hardware, and I opted for the ‘unlacquered brass’ finish, which will age over time instead of staying permanently shiny. The marble top is called ‘Blanc’ marble. It’s 20mm polished stone. I chose it instead of ‘Carrara’ marble because it’s warmer in colour. I’m so happy with the result! 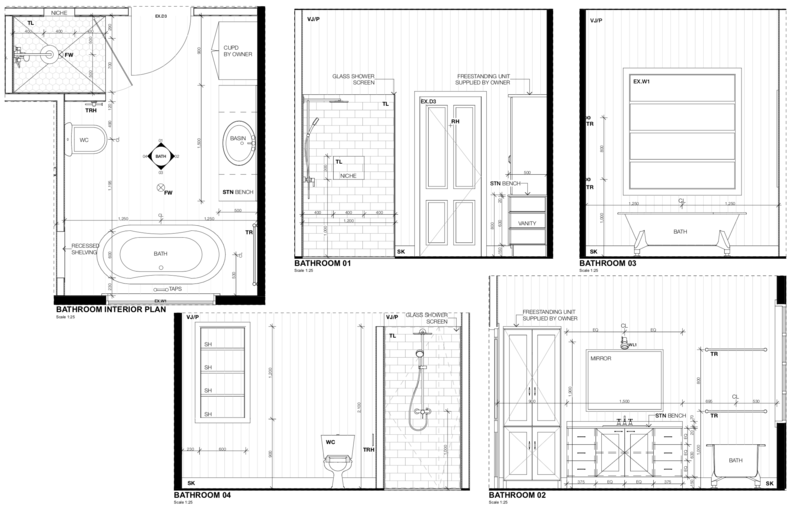 All the tapware is from BelfastSinks.com.au. To be completely honest, we’ve been disappointed with the quality of this tapware. The plumbers have struggled with installation and we’ve had leaking issues which have caused stains on the tiles and been a huge headache for everyone. I was hoping to buy the Perrin & Rowe taps but they were more expensive. In hindsight, we probably spent just as much money on installation with all the problems we had, and we should have just invested in the Perrin & Rowe taps to begin with! A lesson learned. 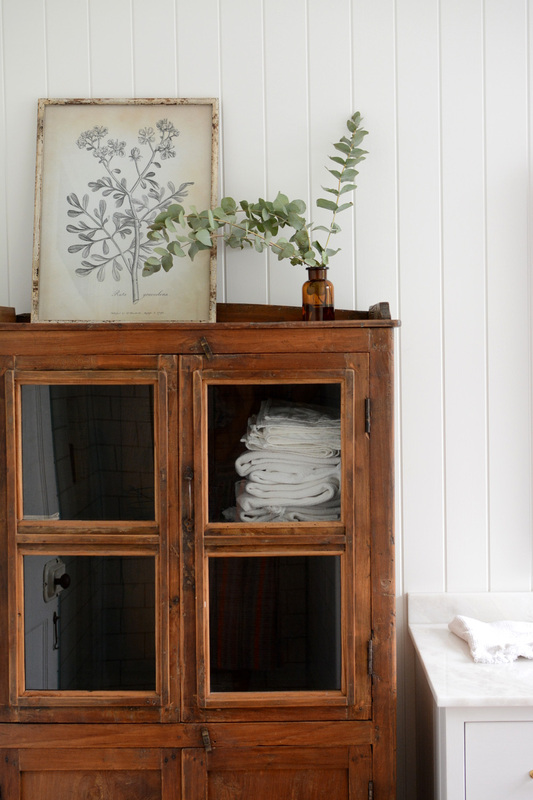 The vintage wooden hutch is a favourite find from Oyster Linen. I love it so much and think it brings so much charm to this bathroom. I bought it a couple months ago and it’s been sitting in a corner of one of the bedrooms just waiting for its spot in the bathroom. The lighting in this bathroom is from Edison Light Globes. The wall light is the Brass Adjustable Arm Wall Mount Light with the clear glass cone. And the ceiling pendant is the Clear Glass Coolie Lampshade Pendant. I found the mirror in a local charity shop for $50. Such a score! Outside the window is a big, beautiful unfurling fern. It came with the house, of course, but the builders asked to remove it when they were moving that big window, and Michael adamantly refused to let it be removed no matter how big of a hassle it was. I’m so thankful he put his foot down about that — it’s so beautiful to see it out the window. I think that’s it in terms of the details in this room. We are all so happy with how it turned out. After the kitchen, it might be my favourite room in the house! Let me know if you have any questions. I’m happy to answer! Renovating is such an emotional process – but it looks like you came out the other side with a happy result! I especially love how you left bits of the old original house to shine beside the new tiles and fixtures. Well done C! Thanks for your questions, Emily. The subways tiles are 100 x 200 mm and the grout is a light grey grout (but not the lightest grey option we had — it was really a medium grey). WOW! That’s like my dream bathroom. I would LOVE a claw foot tub. Thank you for keeping the charm. So many people and designers want to get rid of it. Can you come to Virginia and design my house? Haha! That’s so sweet of you to say. Hi Courtney, So beautiful! You are so talented at making a space feel on trend yet classic and in keeping with the home. Did you have to reinforce the floor under the tub? I was told I couldn’t do a deep tub over my 50yr old wood floors due to the weight – now I’m rethinking it…. Thanks for your sweet feedback. I asked the builders about reinforcing the floors but they thought ours were solid enough as they were. Unfortunately you can’t get Farrow & Ball paints here in Australia, so that wasn’t an option. Really love reno – I love that you chose to keep it true to the period of the house. 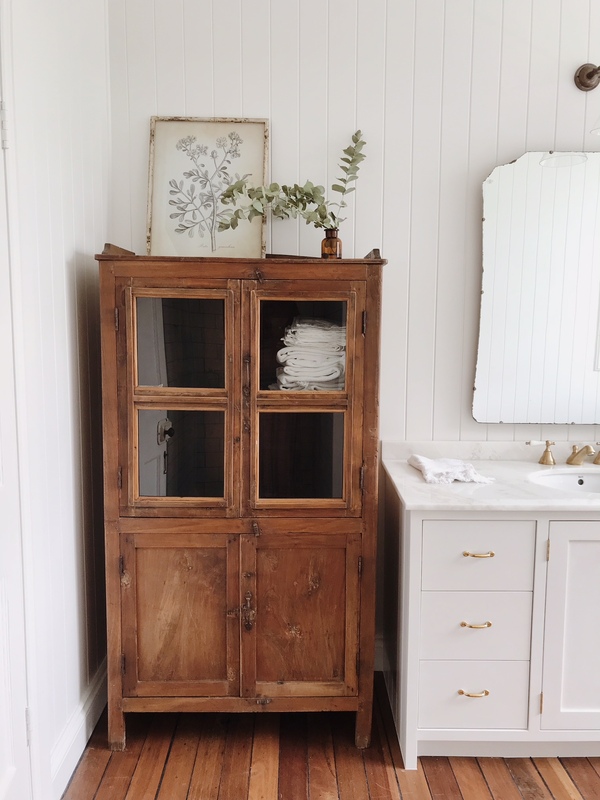 The vintage cabinet is a lovely touch – and love that there’s a practical amount of storage! We have a mid-century inspired modern home and 2 kids. Went with Farrow&Ball pain (all-white) and 4 years in are regretting it. Just not very forgiving when cleaning. I’ve loved watching your renovation process! So inspiring. I’m so curious what you did for wall treatments? I love the wood look! Are they just wooden planks or did you use some sort of beadbord? Oh it reminds me of my grandparents place! So twee and sweet, especially the vanity unit, a little bit ’80’s. You must be so happy with it and relieved it’s all finished. Can’t wait to see the rest! I love how your bathroom has come together Courtney ! My question is about your towels – towels or bath sheets and what brand and any tips for keeping white towels very whit ? Courtney, how is your house heated in winter? 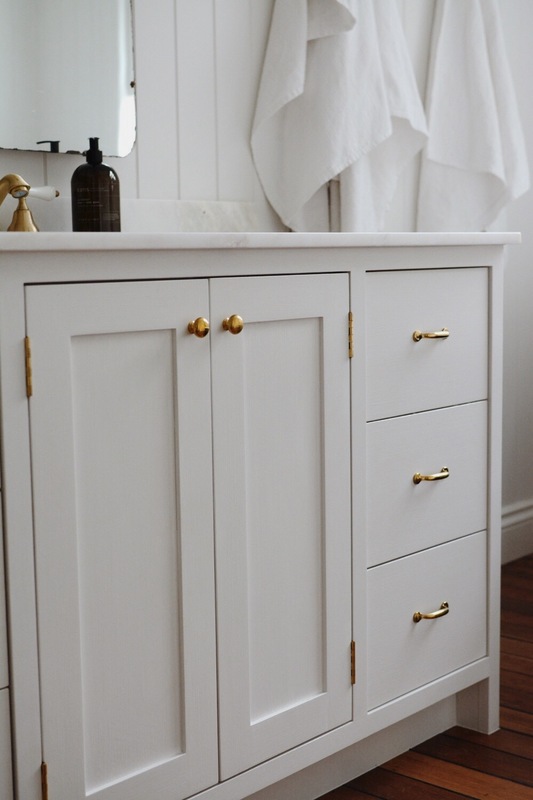 Could you please tell me the name of the vanity brass hardware? It looks right perfect not too old not too new. Thanks and I hope you will do a house tour one day!!! The brass hardware came from Belfastsinks.com.au. Hi Courtney. I love your new bathroom! I especially like the panelboard. I am just in the last stages of deciding paint colour for my new bathroom. What did you use? Would love to know the paint color here! (is it the same as the rest of your home? Thank you!! I love the warmer whites too. Maybe it’s a long shot, but would you know what a similar paint color to Dulux Natural White would be that’s available in the US? I will snap a photo for you and email it to you! We are also doing a reno, I love the V&A bathtub in anthracite and we’re seriously considering importing it to where we live, in India! The fittings are quite hard to source in aged/untarnished brass though, can I ask what waste kit you bought for the bath and in what finish? Did you use any of the V&A ‘kits’? It looks like you didn’t opt for an overflow? Do you find that it’s ok with kids? (We have a 4 year old and an 18 month old). It’s so hard to make all these decisions! Any tips are so appreciated!